CARD Act - Did the World As We Know It End? The Credit Card Accountability Responsibility and Disclosure Act of 2009 shook the credit card market to its core. It was the first major legislation that profoundly impacted credit card regulation in recent memory. There were significant doom and gloom predictions at the time as to the impact of the act on customers, banks, and also partners in the co-brand market. To compound the complexity, the Durbin Amendment impacted economic decisions at banks as debit cards became less profitable, reducing the relative negative expected impacts on credit card portfolios. In October, the Consumer Financial Protection Board issued a report summarizing the results to date of CARD Act. The impacts of the CARD Act are modest. When CARD Act was approved, most programs weren’t directly impacted from a contractual perspective, although a few were when their banks renegotiated their contract. The overall economic environment impacted many more programs, but that can’t be directly attributed to CARD Act. Indirectly almost all programs were impacted from a marketing budget perspective and an increased conservatism with respect to account approval and portfolio management. Attribution of the exact changes to CARD Act is difficult because they overlapped with the economic downturn. Although the cost of credit (fees and interest) were largely unchanged from before CARD Act, the availability of credit has declined substantially impacting the size of the market and hence the potential size for co-brand programs. Leading up to CARD Act’s implementation in Q2 of 2010, the average retail annual percentage rate charged customers increased as banks pro-actively raised the cost of credit to customers. 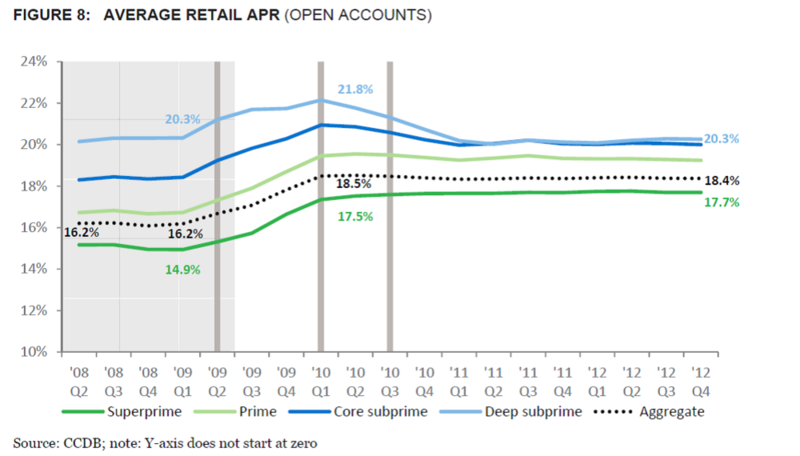 With the exception of deep sub-prime customers, all other cohorts are subject to higher finance charge interest rates than they were before the CARD Act. From this perspective, consumers didn’t do well with CARD Act’s intervention into the market. For revolving accounts, the story is a little better with the average retail annual percentage rate remaining relatively constant, except for deep subprime customers the impact is largely moot or slightly negative. It is interesting to note that there has been a slight downward trend in interest rates that probably reflects profit optimization within revolving customer segments. When fees are combined with the effective interest rate the picture shows that the total cost of credit for revolving customers is largely unchanged compared to the period before CARD Act. Net, CARD Act doesn’t appear to have negatively impacted the cost of credit for customers or revenue for banks except in the subprime market. Due to a combination of the recession and CARD Act, there was a sharp decline in new credit card accounts opened after 2007. Over the same period Private Label credit cards were much more consistent. Part of the decline in new accounts is driven by a decrease in direct mail, the traditional work horse of credit card acquisition, but also by a decrease in approval rates across all levels of credit quality. This decrease is a concern to co-brand programs since a declined customer will have some negative impression of the sponsoring organization. In addition, once an account is approved, there is a lower line issued. This is likely attributable mostly to the general economy. Since accounts tend to go bad at the limit while good accounts tend to not use the full limit, high lines reflect significant exposure. The CFPB has informed the public that they will be looking at deferred credit disclosures and rules as well as rewards disclosures in the future. Both of these are important issues for co-brand program partners and should be tracked carefully to make sure that the programs maximize current contributions but are also well positioned for the future.